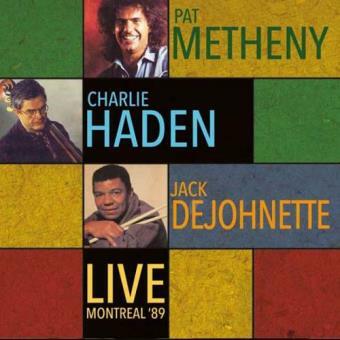 Having played with John Coltrane, Sun Ra, Bill Evans, Ornette Coleman, Keith Jarrett and many others between them, bassist Charlie Haden and drummer Jack DeJohnette were already jazz legends by the time the young Pat Metheny began to make waves in the mid-70s. This unique set was broadcast on Radio Canada in the Salle Marie Gerin-Lajoie during Montreal’s International Jazz Festival on July 5th 1989, and finds all three musicians driving each other to remarkable peaks. It’s presented here with background notes and images. Artigo novo.Artigo proveniente de armazém. Fornecido com acessórios originais.Embalagem danificada.1 ano de Garantia Fnac. Expedição em 72h úteis. Having played with John Coltrane, Sun Ra, Bill Evans, Ornette Coleman, Keith Jarrett and many others between them, bassist Charlie Haden and drummer Jack DeJohnette were already jazz legends by the time the young Pat Metheny began to make waves in the mid-70s. This unique set was broadcast on Radio Canada in the Salle Marie Gerin-Lajoie during Montreal’s International Jazz Festival on July 5th 1989, and finds all three musicians driving each other to remarkable peaks. It’s presented here with background notes and images.